The community around Glendalaugh State Park has a deep connection with and commitment to its state park. Each year, the Glendalough Park Partners hosts the “Walk for Glendalough,” a day where visitors walk, bike, or hike the many trails within the park. Many walk participants raise pledges to garner support for the many park improvements projects that are on the docket. Since 1996, when the first walk was held, the Park Partners has raised nearly $300,000 through this annual fundraising event. Those contributions have enabled the Park Partners to support a growing list of projects within the Park. How does a friends group sustain such an effective and fun fundraising event, year after year? By connecting with walk organizers, we can get a glimpse into what strategies go into spreading the word about an event like this, getting the community involved, and actually raising the money. Glendalough Park Partners gets the word out by providing content for news articles to be included in the local newspapers. They put up posters in Battle Lake and neighboring towns about the event. The Park Partners’s own newsletter includes save the date announcements and feature stories leading up to (and after) the event. The Park Manager works with the DNR to share the event information through other channels. Even with all of these efforts, one of the most challenging parts about the walk is getting the word out to the community. According to walk organizer, Tracy Kortlever, one of the easiest parts about organizing this event is “getting people involved. That’s because there are so many that truly love Glendalough and like to be part of making it even better.” Board members and their families play an important part in fulfilling volunteer roles on the day of the event. Additionally, there are some folks in the community who have been volunteering for this event for many years. Grace S. is the perennial “top award winner” as she collects more than $3,000 in walk pledges each year. While the walk has been a huge “friend raiser” for the park, one of its main focuses is to raise funds for upcoming park improvement projects. In order to do this, walk participants are asked to fill out pledge forms—soliciting contributions from their friends and family—and bring those pledges with them to the walk. The Park Partners mails pledge forms to their membership and makes them available at local businesses and schools. Pledges come from individuals, teams, and businesses. Additionally, an incentive for pledges above a certain dollar amount include receiving a commemorative walk t-shirt! Finally, the Park Partners make sure to communicate the accomplishments that have been achieved with past contributions and what future projects this year’s contributions will go toward. Walk attendees who raised the most money get awards for their great contributions! The Walk is a very important part of the Glendalough State Park heritage. In 1996 the first fundraising event promoted by the Citizens Advisory Board, “March for Parks” took place. 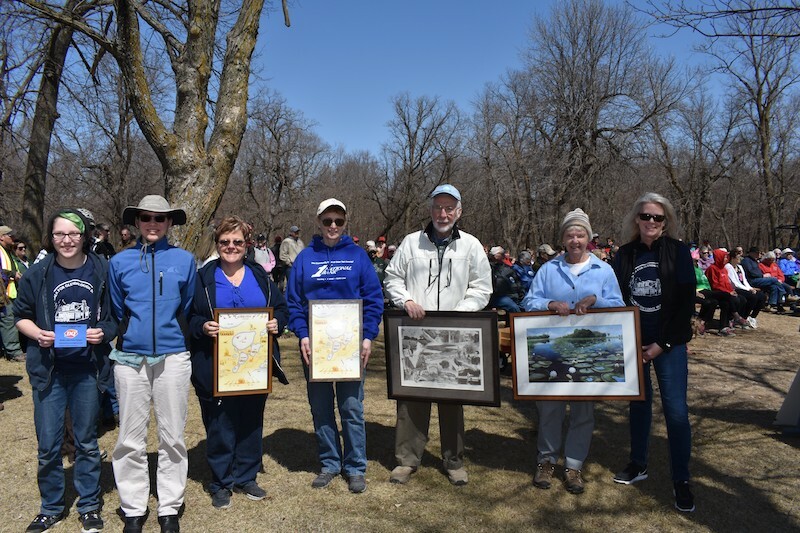 The event name has since changed to “Walk for Glendalough,” and has become an annual fundraising event sponsored by the local Citizens Advisory Board in collaboration with the Parks and Trails Council of Minnesota. Undaunted by gray skies and chilly April winds, 230 walkers of all ages braved the elements to celebrate Glendalough State Park’s first annual “March for Parks” event, Saturday, April 20. 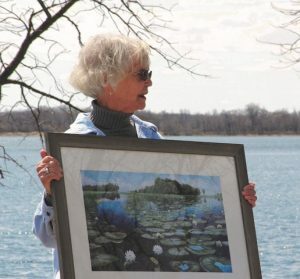 This event was organized to fund a project to help complete a hiking trail around Annie Battle Lake which would include an arched footbridge over the creek. This event did more than contribute to the project, it “bought the bridge” and more. The walkers and their sponsors raised a total of $5555. Local businesses and special group donations added $1770, making the total dollars raised for the project $7325. These funds will be matched by the LCMR (Legislative Committee for Minnesota Resources). As a result, Glendalough State Park’s March for Parks raised over $14,000!! If you would like to join in the Walk fun at Glendalough State Park, show up on April 20 at 9am to bike, walk, or hike around this beautiful park.